Beat the beast in the steeplechase is a dynamic map on the web that displays important information along “The beast”, the freight train that crosses Mexico from south to north. Everyday thousands of migrants use the train to travel from their hometowns to the US border. Our website gives them information about railroad routes, shelters, dinning centers, dangerous municipalities, principal border crossings, Mexican consulates, and detention or migration offices. The identification of these points can make their journey less dangerous, and in some cases Beat the beast in the steeplechase could represent the difference between life and death. Low salaries, lack of jobs, no education opportunities, and high levels of insecurity are some of the causes that push millions of people to migrate from their hometowns to the US. Migrants travel with the dream of improve their quality of life. However, before reaching the country that may provides them job opportunities, they face the struggles to travel thousands of miles with limited resources. This application is made for those men and women who travel on the freight train because they do not have money to pay for a bus ticket. The train nickname is “The beast” because of the many people that lose their lives in their attempt to travel to the promised land. Migrants travel in very bad conditions for long periods of time, with limited food, and with the risk of falling sleep and fall down from “The Beast”. We used the name Beat the beast in the steeplechase as an analogy of all the difficulties migrants face in their way to the US. Specially, since it is well known that migrant’s routes are hubs of criminal organizations, which take advantage of migrant’s vulnerable situation to do several illegal activities. It is important to mention that our objective is not to promote legal or illegal migration to the US. The purpose of the application is to give migrants useful information to alleviate some of their difficulties in the journey. We think that our map will not change people’s decision to migrate, because migration is a very complex social problem that exists despite the huge political efforts to reduce it, but it can give directions to find help and be aware of dangerous points. The innovation of our project is the collection of the information, the friendly way in which the information is presented, and the potential to grow in the future, because it could be used as a community tool where anyone can update information. Shelters: Places where migrants can stay overnight without paying fees. Dinning centers: Places where migrants received free food and water. 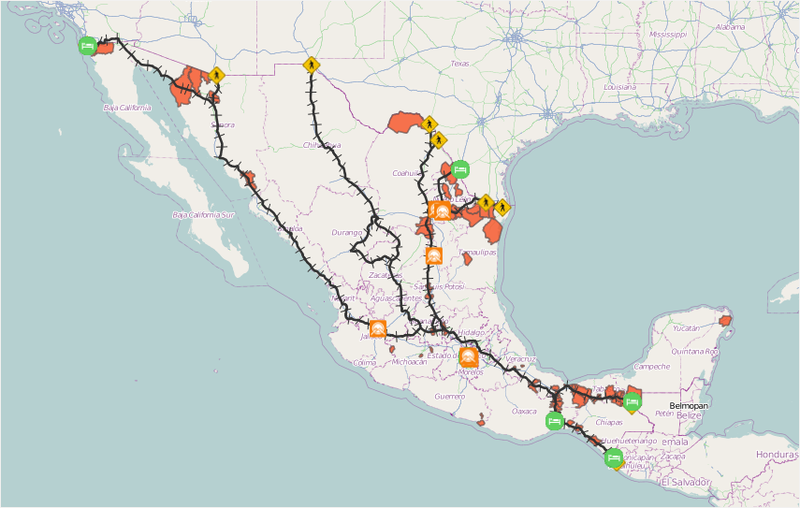 Railroad routes: Mexican freight rail routes. Migration offices: Places where the Mexican Institute of Migration (MIM) provides legal services to visitors and migrants who want to stay in Mexico on a temporary or permanent way. Dangerous municipalities. Municipalities that are dangerous for immigrants by Comision Nacional de Derechos Humanos. Border crossings: Principal Mexico’s international crossing borders. Each layer provides different information that can be used by itself or together with other layers. For example, users can select train routes, dangerous municipalities, and shelter locations. This selection could be used to plan the trip, since the migrants can avoid stopping in dangerous municipalities or they can try to travel through those areas during the day. The application also shows users how far the next shelter or a dinning place is. Additionally, users have access to important site information just by clicking in the different icons. For example, users have access to shelter name, address, and phone number. It also provides direct access to the shelters website, in case it has one, just by clicking in the shelter name. This feature allows users to change the base layer. It can be used to modify the predefined background layer (the OpenStreetMap which has a white background with principal highways, cities names and other information provided by the community). Other background options are NASA topography and GEBCO topography. These two options allow users to see the terrain along the railroad routes. The base layer can also be used to select one fixed layer in the map. The default layer is Dangerous Municipalities, but users can change it depending in their necessities. Since the application was developed to be used mainly by Spanish speakers, it has two language settings: English and Spanish. The language is automatically determined by the predefined browser language configuration. If the browser configuration language is in Spanish, the application will show the web content in Spanish. If the browser configuration language is in English, or any other language, the web content will be display in English. Any of the layers can be download as a KML file. This file can be used by any KML client like Google Earth. This feature can be used to display the data provided by our application with other information, for example all the data from Google Earth. This feature allows the user to change the opacity of individual layers by clicking the plus and minus icons in the Transparency menu. This feature is very useful when multiple layers are display at the same time because it allows the user to see in a very light color the information layer without limiting the visualization of other layers. Download data is an important tool that allows anyone to have access to ALL the information that is display in the application. This feature allows users to download the data directly from the website. This is very important because, as most of the people participating in this event should know, access to data could be a challenge, and specially georeferenced data. With our application all the data is available and it can be download as shape files, well know GIS format or as KML, which can be displayed in clients like Google earth. We think the information should be open to the public, especially because we would like this application to be a community collaboration tool used by the migrant community and stakeholders interested in the topic. In the current version of our website it is possible to add new shelters easily by using a web form and locating new shelters directly on a map. This feature can be extended for the other layers and, in the future, it could be used to add different types of data . Using a web form like ours to add new data makes it very easy to maintain a website and increases the life span of the project. The information is contained in this application came from different sources. The list of dangerous municipalities is based on information from the Mexico’s National Commission for Human Right (CNDH). Migration offices, Border crossings, Mexican consulates in the US, and Detention Facilities are public information published in different institution websites. Shelters and Dinning centers were collected from different websites on the internet. We know that our application does not have all the existing shelters and dinning centers. However, the Adding Data feature will allow people to update the information in the future. So far, we think or application is a good start point that can be improved with community collaboration. Beat the beast in the steeplechase has a great potential to grow because it can be used as a collaboration tool by different stakeholders to bring together useful information for migrants and their families. In fact, this application can be used to join efforts of different participants in this contest. For instance, we could display English volunteers from ConnectENG in the map, information about job opportunities like Inner Job Channeler and warnings and tips similar to Invisible Friend. We also know that many migrants do not have access to internet and therefore they do not have access to the application while they travel. But it can be used by shelter's administrators, NGO’s, and political leaders to provide migrants with this information. It also can be used by migrant’s families to located missing people. Since they can find detention offices, shelters, and dinning centers information all in one place. If a migrant has been arrested, families would be able to find migration or detentions offices location and information within a click. In the future the Adding Tool could be expanded for sharing dangerous places to avoid or report crimes.